I had to sigh and stop myself this morning. Once again I had fallen into the trap of saying things to myself that I would not allow anyone (including and especially me) say to one of my children. You know how it is. You make a mistake, or something goes wrong, or an experiment fails, and the words “stupid!” and “always!” are launched inside your head like misdirected torpedoes. I wasn’t going to to do that any more. 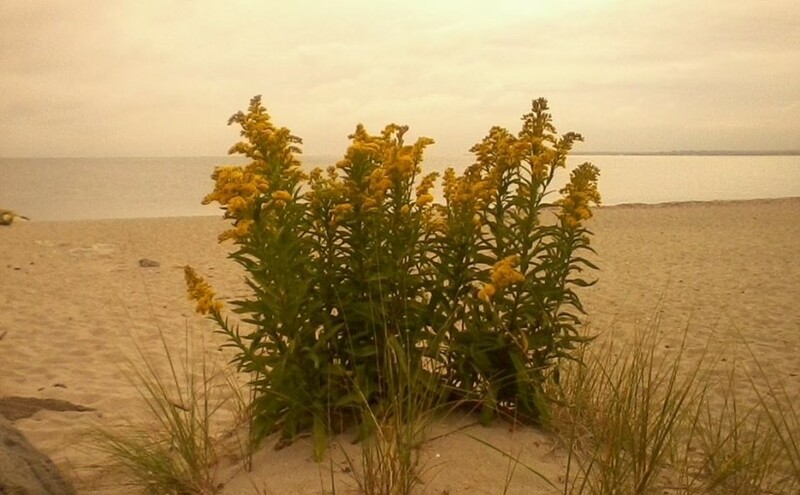 But it is a habit that has to die. Really, this is beyond a “giving it up for Lent” thing. This is a thing that all of us, and perhaps especially women, have to work on. Yes, on some level, we all have to be our own severest critics (though surely there are people who seem to have volunteered, in all of our lives, for that position). But the law of kindness has to be in our heads before it can be on our tongues. Rewinding the tape, re-evaluating my evaluation. Breathing, and not letting That Voice win the day. 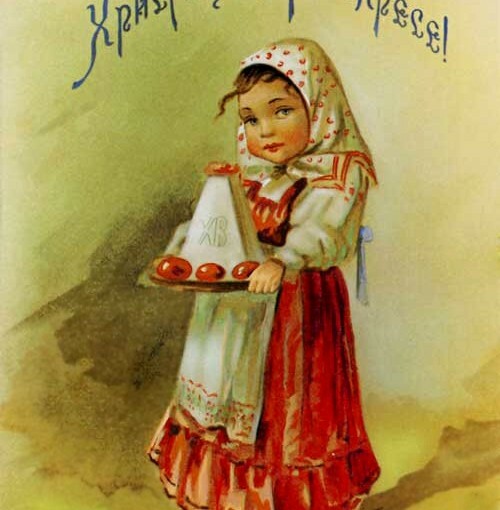 One of the traditional Russian Easter dishes is “syrnaja pascha,” or “Pascha Cheese.” It is a cheesecake like dish which is molded in a special pyramid shaped mold and which is served on slices of kulich, a rich, eggy sweet bread. You make the Pascha cheese with the farmer’s cheese whose recipe I posted here earlier. Here is my favorite recipe for Pascha Cheese. thin farina. Cook until hot—DO NOT BOIL. It will be quite liquid. Put the pot in the sink and surround with ice. Let cool and mix occasionally. It will firm up. Wet cheesecloth (or cloth). Put it in your mold. Fill with pascha. Cover the top of the mold with more cheesecloth. Now, here opinion divides. The person who gave me the recipe doesn’t use a weight on hers; I put a can of beans on top of mine to hasten the draining process. I guess it’s your choice here. 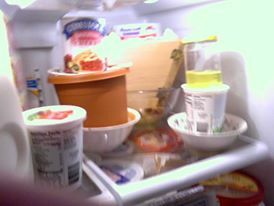 Leave this in the fridge until it firms up. If you don’t have a pascha mold, a clay pot makes a decent substitute. Because it is, to some degree, cooked, this recipe stays fresh longer than other pascha recipes I’ve tried. Pascha cheese in the refrigerator under weights. Purists mix this in the pan, but I use a mixing bowl, to keep the floor clean. oil. Over this pour warm water and mix back and forth until all is mixed. Do not beat. Bake at 350 degrees for 30 minutes. Top with frosting or sprinkle with powdered sugar. Omit cocoa and add up to one cup chocolate chips. Add up to one cup of chocolate chips. In place of water, use all the juice from a jar of maraschino cherries plus enough water to make two cups. Chop the cherries (or don’t) and add them at the last minute. Use applesauce instead of water. Add 2 teaspoons (okay, tablespoons) cinnamon. 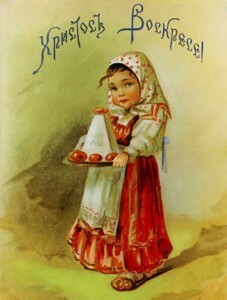 This year, Orthodox Easter, or Pascha, will fall on May 1. One of the dishes we traditionally make is called syrnaja pascha, “pascha cheese.” It is a cheese-cake like food that we mold into a pyramid and eat slathered onto a sweet bread called kulich. One of the ingredients for pascha cheese is farmer’s cheese. Apparently there are two kinds of farmer’s cheese. One is a hard product that you can chop up and put in salad. It’s closely akin to paneer and does not lend itself well to blending or molding. The other is the kind that they sell in Russian stores. We could not find it in the part of Houston where we lived for eleven years, so the ladies at church taught me how to make my own. Cover with a towel and place out of breezes for a day and a night and a day. In the morning you will see a mountain of curds in a sea of whey (unless it doesn’t work. Some years it doesn’t work, and California milk needs to be treated differently for reasons I do not understand). 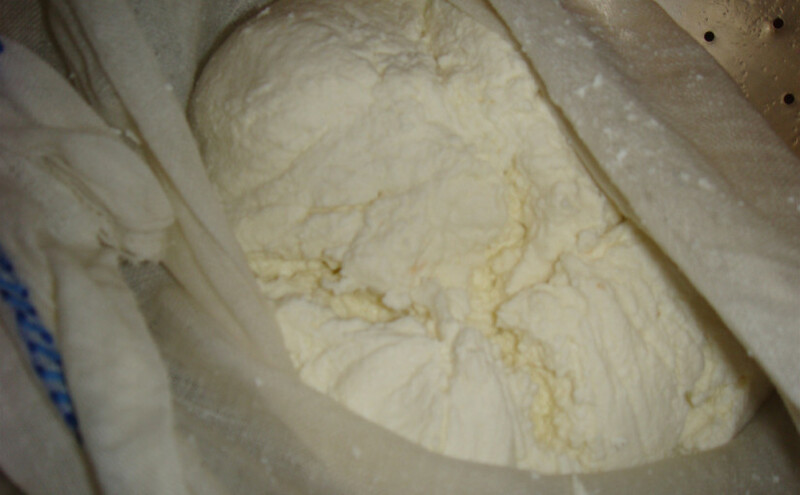 Strain the curds into a very clean pillow case or tee shirt — cheese cloth has too wide a weave for this. Refrigerate in a closed container until you are ready to use. 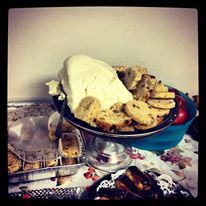 One gallon of milk plus one quart of buttermilk makes approximately two and a half pounds of Farmer’s Cheese. Does it save money? Yes! Locally, in Fairfield County, Connecticut, Farmer’s cheese runs from $3.99 to $7.99 per pound. I can make ten pounds of cheese for about ten dollars. If the man had played his cards right, I would have been making him a lenten chocolate cake today to share with our fourteen musically gifted and yet unpretentious children. But his loss is my gain. Since David Cassidy forgot to propose, I was available when my husband came into my life. So it worked out. How bad a crush did I have on him? I learned the harmony to his songs, so I could step in for his back-up singers at the last minute. I wrote not one but two love songs to him, both of which my younger brother later taught to my kids. Through no choice of my own, he and I at one point had the same haircut. My mother’s hairdresser called it a “pixie cut” and said it would make me look like Shirley Jones. It made me look like David Cassidy. It was a female mullet. We also had almost matching purple pantsuits with a vest. I think both of our mothers bought those for us. 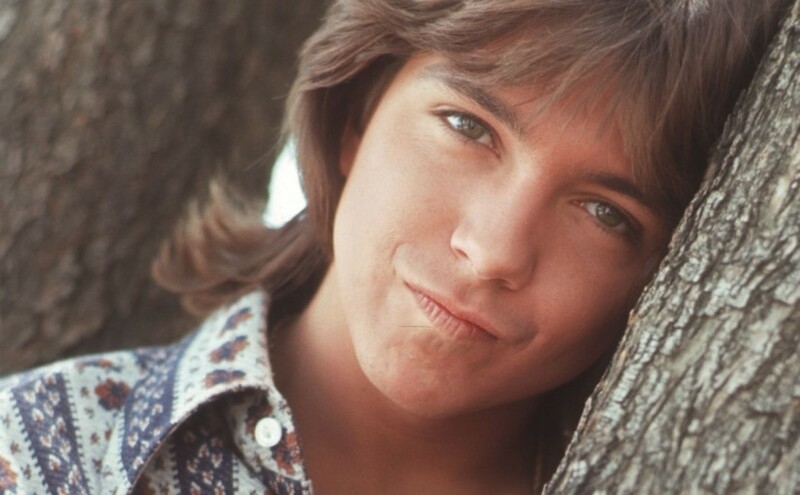 I did not know that tacos existed until David Cassidy talked about going to the taco stand on “The Partridge Family.” I still didn’t know what this exotic food was for another ten years. At his sold-out 1973 concert in Boston, I swear that he looked directly at me at one point when he sang. But so did everyone else there. I am glad that he made it to be sixty-six today — so many child stars did not — and I hope he has a long, happy and musical life. Even if he did blow his chance to convert and propose. I even had a godfather picked out for him. It is still Lent for Orthodox Christians, when we eat vegan. 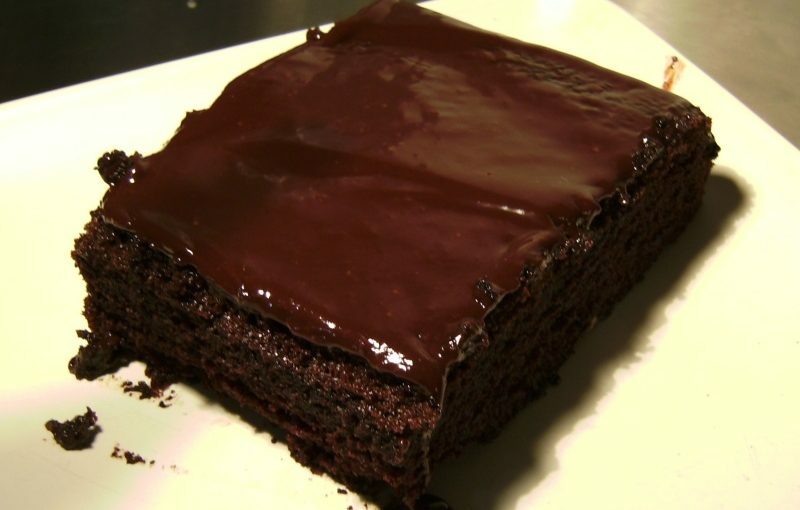 Lenten chocolate cake recipe to follow.